The Harvard Microrobotics Lab has demonstrated the first controlled flight of an insect-sized, flapping-wing robot. 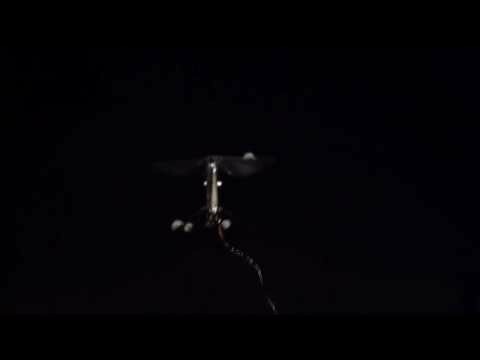 This video shows the 80 mg, piezoelectrically actuated robot achieving hovering flight and performing a simple lateral maneuver. Power and control signals are provided via wire tether. This work was funded by the NSF and the Wyss Institute. This archive film, though long, provides graphic details on a relatively modest nuclear accident illustrating the difficulties that still face researchers working to provide robotic solutions. This chapter presents an overview of the state of the art in mining robotics, from surface to underground applications, and beyond. Mining is the practice of extracting resources for utilitarian purposes. Today, the international business of mining is a heavily mechanized industry that exploits the use of large diesel and electric equipment. These machines must operate in harsh, dynamic, and uncertain environments such as, for example, in the high arctic, in extreme desert climates, and in deep underground tunnel networks where it can be very hot and humid. Applications of robotics in mining are broad and include robotic dozing, excavation, and haulage, robotic mapping and surveying, as well as robotic drilling and explosives handling. This chapter describes how many of these applications involve unique technical challenges for field roboticists. However, there are compelling reasons to advance the discipline of mining robotics, which include not only a desire on the part of miners to improve productivity, safety, and lower costs, but also out of a need to meet product demands by accessing orebodies situated in increasingly challenging conditions. This video shows the Autonomous Haulage System (AHS) implemented as part of Rio Tinto's Mine-of-the-Future initiative in North-Western Australia. This video showcases the Ladybird, an intelligent robot for the vegetable industry. Ladybird provides a flexible platform for sensing and automating commercial vegetable farms. The solar-electric powered vehicle has a flexible drive system that allows precise motion in potentially tight environments, and the platform geometry can be configured to suit different crop configurations. The vehicle autonomously traverses the farm, gathering data from a variety of sensors, including stereo vision, hyperspectral, thermal, and LIDAR. The data is processed to provide useful information for the management and optimization of the crop, including yield mapping, phenotyping, and disease and stress detection. Ladybird is equipped with a manipulator arm for a variety of mechanical tasks, including thinning, weeding (especially of herbicide-resistant weeds), spot spraying, foreign body removal and to support research towards automated harvesting. This video shows an example of 3-D, whole-body motion generation combining manipulation and dynamic biped locomotion, based on two-stage motion generation. At the first stage, the motion planner generates the upper-body motion with a walking path of the bounding box of the lower body. The second stage overlays the desired upper-body motion on the dynamically-stable walking motions generated by a dynamic walking-pattern generator, based on preview control of ZMP for a linear, inverted-pendulum model. If collisions occur, the planner goes back to the first stage to reshape the trajectory until collision-free motion is obtained. This chapter will focus on the motion control of robotic rigid manipulators. In other words, this chapter does not treat themotion control ofmobile robots, flexible manipulators, and manipulators with elastic joints. The main challenge in the motion control problem of rigid manipulators is the complexity of their dynamics and uncertainties. The former results from nonlinearity and coupling in the robot manipulators. The latter is twofold: structured and unstructured. Structured uncertainty means imprecise knowledge of the dynamic parameters and will be touched upon in this chapter, whereas unstructured uncertainty results from joint and link flexibility, actuator dynamics, friction, sensor noise, and unknown environment dynamics, and will be treated in other chapters. In this chapter, we begin with an introduction to motion control of robot manipulators from a fundamental viewpoint, followed by a survey and brief review of the relevant advanced materials. Specifically, the dynamic model and useful properties of robot manipulators are recalled in Sect. 8.1. The joint and operational space control approaches, two different viewpoints on control of robot manipulators, are compared in Sect. 8.2. Independent joint control and proportional– integral–derivative (PID) control, widely adopted in the field of industrial robots, are presented in Sects. 8.3 and 8.4, respectively. Tracking control, based on feedback linearization, is introduced in Sect. 8.5. The computed-torque control and its variants are described in Sect. 8.6. Adaptive control is introduced in Sect. 8.7 to solve the problem of structural uncertainty, whereas the optimality and robustness issues are covered in Sect. 8.8. To compute suitable set point signals as input values for these motion controllers, Sect. 8.9 introduces reference trajectory planning concepts. Since most controllers of robotmanipulators are implemented by using microprocessors, the issues of digital implementation are discussed in Sect. 8.10. Finally, learning control, one popular approach to intelligent control, is illustrated in Sect. 8.11. The control architecture of the PID tracking controller is introduced. Moreover, according to the gain change, the performance variations of the PID controller implemented in the digital control system are shown. As of 2013, almost all robots have access to computer networks that offer extensive computing, memory, and other resources that can dramatically improve performance. The underlying enabling framework is the focus of this chapter: networked robots. Networked robots trace their origin to telerobots or remotely controlled robots. Telerobots are widely used to explore undersea terrains and outer space, to defuse bombs and to clean up hazardous waste. Until 1994, telerobots were accessible only to trained and trusted experts through dedicated communication channels. This chapter will describe relevant network technology, the history of networked robots as it evolves from teleoperation to cloud robotics, properties of networked robots, how to build a networked robot, example systems. Later in the chapter, we focus on the recent progress on cloud robotics, and topics for future research. A multi-operator, multi-robot teleoperation system for collaborative maintenance operations: Video Proc. of ICRA 2001. Over the past decades, problems and notable results have been reported mainly in the single-operator single-robot (SOSR) teleoperation system. Recently, the need for cooperation has rapidly emerged in many possible applications such as plant maintenance, construction, and surgery, and considerable efforts have therefore been made toward the coordinated control of multi-operator, multi-robot (MOMR) teleoperation. We have developed coordinated control technologies for multi-telerobot cooperation in a common environment remotely controlled from multiple operators physically distant from each other. To overcome the operators' delayed visual perception arising from network throughput limitations, we have suggested several coordinated control aids at the local operator site. Operators control their master to get their telerobot to cooperate with the counterpart telerobot using the predictive simulator, as well as video image feedback. This video explains the details of the testbed and investigates the use of an online predictive simulator to assist the operator in coping with time delay.